The companions of Anchorsholme Chapter No 5854 together with their guests held their annual installation convocation at Cleveleys Masonic Hall. The companions were delighted to have Third Provincial Grand Principal Ian Higham as their main guest for the evening. Pictured from left to right, are the new principals; John Pitches, Andrew Harrison and Terry Murtagh. The chapter was opened by first principal James Rashid assisted by the second principal Andrew Harrison and the third principal John Pitches. James conducted the early business of the chapter with ease. At this point David Thomas entered to announce that Ian Higham was without and demanded admission. Ian Higham was accompanied by North Fylde Group Deputy Chairman Tony Hough, Assistant to the Provincial Grand Principals Duncan Smith, Harry Cox, Ian Ward, Norman Thomas, Stuart Thornber, Malcolm Worsley, John Lee, Martyn Jones, Chris Perfect and Provincial Deputy Grand Director of Ceremonies David Thomas. Ian was warmly welcomed to the chapter by James and his co-principals and offered the sceptre of the chapter which Ian quickly returned to James’s safe hands saying that he wasn’t here to work. The formalities over James asked that, for the purposes of installation, Harry Cox assumed the second principal’s chair, Brian Vaughan that of the third principal and Alan Lock to act as Scribe Nehemiah. 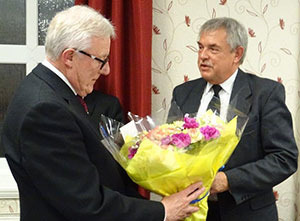 Ian Higham (left) receives flowers from Andrew Harrison. Once the installing officers were in place, James installed his successor Andrew Harrison as first principal. Andrew installed John Pitches as second principal and John installed Terry Murtagh as third principal. The scripture readings were given by Bob Stafford, Geoff Diggles and Gavin Egan. 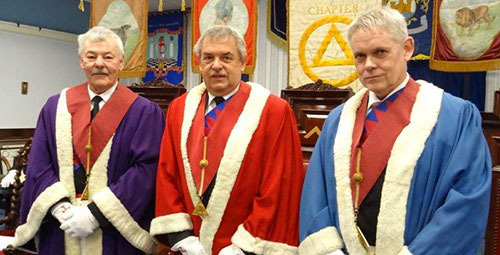 The robe addresses were presented by David Sangster (scarlet robe) Geoff Diggles (purple robe) and Gavin Egan (blue robe) who showed their dedication to the chapter with the sincerity of their presentations. Further presentations were that to the principals delivered by John Chesters, the address to the officers by Duncan Smith and the final presentation to the companions of the chapter by Ian Higham; all faultlessly done. Once all the presentations were finished and the officers invested, James rose to say those immortal words: “That concludes the ceremony of your installation.” This in turn was the cue for Ian to bring the greetings from the Provincial Grand Superintendent Tony Harrison. Ian also thanked James for all his hard work as installing principal and for the contribution he had made to the chapter throughout his year in high office. In reply, Andrew presented Ian with cheques for £250 for the MCF 2021 Festival, £50 to the West Lancashire Freemasons’ Charity and £100 to Trinity Hospice and £150 to Inspired Futures (the charity chosen by James Rashid). Ian thanked the companions of the chapter for their generosity. The convocation closed, the newly installed principals, the members of the chapter and guests retired to enjoy the festivities in the Park Suite. John Chesters sings the principals song to John Pitches, Andrew Harrison and Terry Murtagh. In his response to the toast to the health of the grand officers, Ian wished the principals good health for the coming year. He also congratulated those who had received promotions and appointments. Ian moved on to promote the virtues of the MCF 2021 Festival, asking everyone to support it and to use the white envelope scheme. Ian asked the companions to promote the Royal Arch within their Craft lodges and to encourage brethren who were not already members to join it and complete their Masonic journey. Ian completed his response by thanking the chapter’s scribe Ezra, Umesh Dholakia and his assistant Vic Worrall, for the information that he had provided to him prior to his visit. He also complimented the director of ceremonies Martin Linton for his hard work in putting on splendid ceremony. The principal’s song was rendered by John Chesters accompanied on the piano by Malcolm Worlsey. A raffle raised £200 for charity. The janitor’s toast was given by Peter Tebbs. Prev:What colour is octopus’ blood?